Think Tenerife and snow probably isn't the first image that comes to mind. The most popular year-round sunshine holiday destination in the Canaries for British visitors tends to be about the beaches and the bars rather than mountainous terrain and white-capped peaks. Look beyond the stereotypes though and Tenerife becomes a far more versatile holiday option. 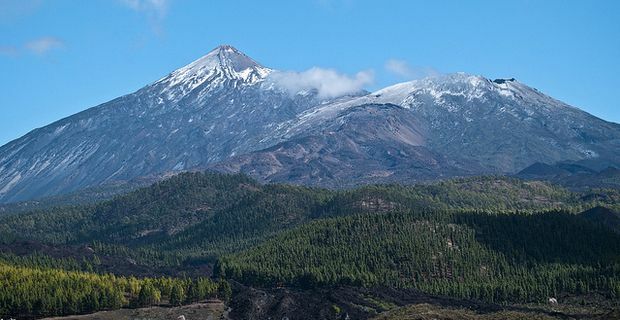 The Teide National Park, located in Tenerife offers visitors an introduction to aspects of this fascinating island that might not be familiar to the masses. The Teide peak dominates the centre of the island, looming at 3,718 metres, Spain's highest mountain. The height sounds daunting but reaching the summit requires merely a modicum of fitness. It helps that there is an obliging cable-car that cuts out much of the six-hour uphill slog. The remaining climb to the top from the cable car station is a mere 200 metres. When taking your pictures at the summit, just be sure to keep the cable car out of shot and try to look exhausted. Those planning an ascent will need to obtain a permit from the web page, which gives you a specific date and time for your climb. Below the summit, you can explore some of the Canaries' most fascinating spaces, with flora that have adapted to the extreme weather conditions and the lack of moisture. The striking Teide violet and the local bugloss and broom give the slopes a vibrant appearance, distinct from expectations of a volcanic wasteland. Wildlife is inevitably sparse, mostly introduced species like rabbits and the moufflon, but it is possible to spot lizards, geckos and skinks flitting around the rock formations. Birdwatchers should look out for the blue chaffinch, Berthelot's pippit and, appropriately enough, wild canaries. For a comfortable stay in the shadow of the mountain, the Parador conforms to the levels of luxury regular Spain visitors expect from this chain. It's a modern mountain construction that includes a gymnasium, sauna, heated swimming pool, bars and a restaurant. Sample typical Canarian dishes including the puchero stew, rabbit in piquant salmorejo sauce, the wrinkled, salted potatoes called papas arrugadas, grilled parrot fish and the Canarian green (coriander) or red (chilli) mojo sauces. Ulookubook Tenerife: A great way to holiday! The Canary Islands - which one and why?